After that first 10k race in Winston-Salem on Mar. 11th 1978 my running had new meaning. Now I was not just running to stay in shape but I was beginning to train. It wouldn't be long afterwards that my dreams of body-building would be behind me as I fell in love with the running so completely. I had bought my first pair of real running shoes , a pair of Nike Waffle Trainers in Nov. of 1977 and then my wife bought me some New Balance 320's for Christmas so those are the two pairs of shoes I alternated wearing in 1978. I was so excited after that first race that I couldn't wait to run another one and then I heard about the WRAL 101.1 run for fun the very next Sunday. The race turned out to be very poorly planned which wasn't unusual for that period but I was disappointed because I thought the one in W-S was very well organized. They said they were expecting maybe 20 runners but 166 showed up. It was a freakish hot day for March and they had no water on the course or at the finish line. To their credit they did take my name and address and mailed me a t-shirt. Over the next few weeks I began to get more serious with the training and began doing some of the workouts I had read about from some of the big coaches of the era. I was doing some fartlek and mile repeats on the road and occasional time trials. By the end of March I was already making plans to build my mileage for a marathon with the plan to run in Greensboro in October. My next race would be the Dogwood 10k in Statesville on April 29th. This one would be better organized but would turn out to be a very hilly course. I noted that although my time of 49:13 was 14 seconds slower than my 1st one, that with the hills and warmer weather it was actually a better effort. I sprinted against a guy and two girls at the finish, beating them all but spewing gatorade for my effort. Well worth it. The next month I would be focusing on getting ready for the first Great Raleigh Road Race. We were very excited that Raleigh was going to get a "big" race. I was working at the Revco in downtown at the time and my boss John White had been doing some training with me. We did several runs on the course to get ready leaving one car downtown and leaving one at the fairgrounds. Unfortunately I began to have hip pain and with two weeks to go before the race I couldn't run. I was afraid I wouldn't even be able to run the race. In many ways the race was a disaster but it in others it was hugely successful. They said maybe a thousand runners would enter but were really expecting 500. What a shock when 2364 registered. The course started next to the Capital on Hillsborough Street and ran straight out to the fairgrounds with the finish inside Dorton Arena Or that was the plan. It was certainly an experience running with that large crowd in a time when 100 was considered a big race. It was a hot day and again the organizers weren't prepared for the crowds. I made my way through the pack as best as I could but was not having a good run. Obviously I was doing better than a lot of people and I think there must have been large numbers of people that had no idea what they were getting into. Although I was hurting by the time I got to the 4 mile mark I was passing large groups of people running slowly and walking and I noticed several were passing out along the road. I went through 5 miles in 41:30, not too far off my previous times but I will never know what my finish time was. By the time I got to Dorton Arena the finish line was so overwhelmed that we had to stop running and wait and walk in a long line before we could finally get inside to cross the finish. I was not too happy with that but what can you do? The winner was Robbie Perkins , a Duke runner in 30:11 and Raleigh and NC State runners Julie and Mary Shea took 1st and 2nd for the women. I think Mary may still have been running in HS for Cardinal Gibbons at the time. After my first race I had gotten my brother excited and he began running and he did GRRR as his first finishing in about 57 minutes. It wouldn't be long before he would be beating me. I didn't run at all the next week due to the hip and a sore calf but like the foolish excited beginning racer I was,I still was planning to run another 10k the next weekend if at all possible. 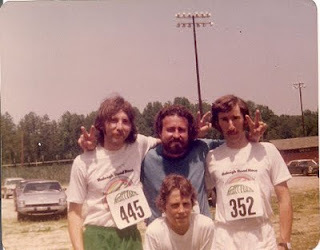 You may have noticed that the 10k was the king of races distances in the 70's. So the next weekend on June 10th we made the trip to Salisbury to run a race at Catawba College. My brother and I along with my wife Edith who was now pregnant with our first child and John and his wife Peggy and son Ritchie. The ladies would be cheering us men on. That is the four of us in the photo after the race. It would be a hot day and the race didn't start until 10am. I ran well but my hip was really bothering me most of the run. I set a pr of 46:37 but afterwards had to face the reality that I had my first running injury. This makes me feel soooo young. I wasn't even born then! I didn't realize how far the sport of running has come since the '70s.